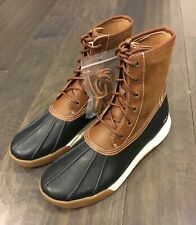 Ralph Lauren Polo Andres Leather Winter Duck Boots Size 11D. Obvious signs of wear throughout. There’s creasing and scuffs throughout which gives them some really cool character. Size 11D. Does not come with original box! Men’s Polo Ralph Lauren Double Zip All Weather Leather Boots Sz 11D. Monk style Velcro fastening has some wear on the inside. Slight distress noted on the outer aspect of the right boot. Please see all photos. Condition is Pre-owned. 'Fresh' High Top, Sneaker ~ Boot Hybrid. Waterproof - Makes these Fashionable and Functional. I strive to provide fast, positive service. Item : Ralph Lauren Polo Boots. Item is 100% Authentic. Item does not include original box. -Open for negotiation. Normal signs of wear, upper leather in good condition. STYLE: MATHEW VACHETTA BOOT. ORIGIN: MADE IN SPAIN. COLOR: BLACK. I will mark the SHOES as low Value so. Designer =Ralph Lauren. Lace Up Ankle Boot. Category: Boots. Fabric =Leather. Color =Brown. Shoe Size =11. RECIEVED IN CONDITION SHOWN. READY TO WEAR. 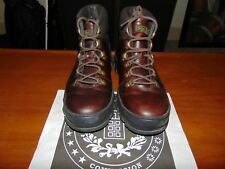 Lightly used, clean and in great condition POLO RALPH LAUREN Canopy black leather casual boots. No noticeable wears and tears. Size: Men's 11 D Tag's reading: AAM12102 11 D Measurements: Insole - 11 3/8 inches long Features: Material: Leather Dependable, quality construction Cushioned, padded ankle collar Smooth, full-grain and distressed leather looks great Versatile style looks terrific with jeans or whatever We are happy to answer all questions to ensure a proper fit, but are unable to guaranty a proper fit. If your purchase does not fit, please notify us within 3 days of receipt and we will be happy to accept return. RALPH LAUREN. Ralph Lauren Country. Material: genuine leather upper, leather lined, rubber sole. The interior and outsole is in excellent condition. Original Size :unknown, but fits as size 11. Main Color: brown. I AM THE ORIGINAL AND THE ONLY OWNER. SMOKE AND ANIMAL FREE ENVIRONENT. I ONLY WORE IT ONCE AND THEN FORGOT THEY WERE IN MY CLOSET. You may also be interested in. Pre owned in good condition. Real nice like new leather boots.